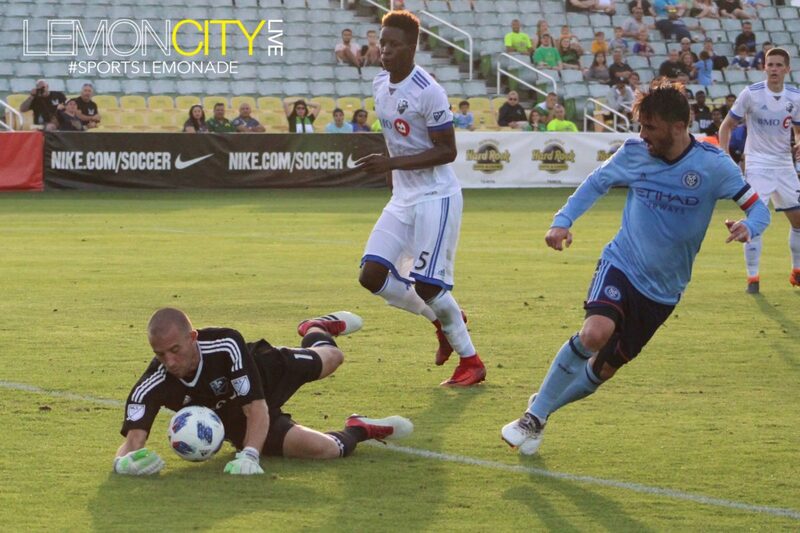 St. Petersburg, FL – With both the MLS season (March 3rd) and USL season (March 16th) about to kick off in a matter of weeks, your favorite Lemonheads made the trek up north to beautiful St. Petersburg Florida, for a final couple of preseason games. This is our second year here for the Suncoast Invitational, and like last year, it was well worth the drive. For just a few bucks, Tampa Bay Rowdies fans were treated to two top quality matches. The first game pitted NYCFC and their international star, FIFA World Cup champion David “El Guaje” Villa. El Guaje is a three-time MLS All-Star and a 2017 MLS Bext XI winner. He went up against the Montreal Impact led by two-time All-Star Ignacio “Nacho” Piatti. This was a battle of two things I love: pizza and poutine. This one was really hard to choose. I’ve only really had poutine just a couple of times, but the impact it has left on me (pun intended) has been well documented. On the flip side, I’ve maybe eaten pizza more than any other food in my life, just saying. Food debates aside, the game lived up to the hype. The crowd for the game was a little disappointing, to be honest. Like I mentioned at the start, this was a two-for-the-price-of-one ticket. Not only would the Tampa Bay locals get to see NYCFC take on the Impact, but they would also be treated to a Rowdies vs Philadelphia Union nightcap afterward. To be fair though, the crowd for the Rowdies game was way more electric and definitely “rowdy”. Crowds aside, the first game was actually legit. Both squads played with the probable lineups that they will open the season with next weekend. Both teams’ stars also played the full 90 minutes. What can I say about Villa that hasn’t already been said. Dude is all time. Today was just another notch on the resume and a true treat to those in attendance. Villa started off the scoring in the 12th minute with the cheekiest of chips over a sliding Impact goalie. No big deal. He followed that up in the second half with a classic curling free-kick over the wall that clipped the post and went in, just inches away from the diving goalie, again. Be advised MLS, El Guaje is in midseason form already. My boys from the north would not go away so easily though. The Impact would score two goals in less than five minutes, capped off by Nacho’s intercepted pass deep in the NYC zone, which he then turned around and slotted it by the NYC keeper. The game finished in a 2-2 draw and both teams looked really impressive and ready to start the season. The battle of pizza vs poutine will have to wait. The nightcap was all Rowdies. First-half goals by Jochen Graf and Michael Nanchoff led to a 2-1 victory against Philly. One issue I must point out as the resident uniform guru of Lemon City Live. I did NOT like the Rowdies kits. It was an all white on white ensemble, and I was not feeling it. Bring back the yellow and green stripes! Moving along, the Rowdies also looked very good tonight. They seem to be finally clicking after a rough preseason that saw them winless going into this game. As for Philly, they looked really off to me. Maybe I was still distracted trying to figure out who won between pizza and poutine, but the cheesesteaks did not look in unison at all. They did manage to score a beautiful free kick, but that was just a small sample of the overall game. Also, I wasn’t really able to get a good feel for the team, since midway through the second half, they did a mass substitution that saw an entirely new starting 11 enter the field. Never seen that before. Tampa Bay, I hope you enjoyed this. Top quality stars, top quality teams, and top quality action. We’re thirsting hard for some good soccer action back home, and we can’t wait till Beckham and his squad rolls out on the field in 2020. We still have plenty of time to wait though, and I’ll still keep making this trip every year. I love this game too much. Thank you Rowdies for the hospitality. We will most definitely be back this season for some USL action. Be ready Tampa. Sports Lemonade is coming! For more photos of the NYCFC vs Montreal Impact game, please CLICK HERE. For more photos of the Philadelphia Union vs Tampa Bay Rowdies game, please CLICK HERE.